UNICEF USA in Houston offers a variety of volunteering opportunities through the UNICEF UNITE program. UNICEF supporters (UNITERS) often join hands to help educate, advocate and fundraise locally for the most vulnerable children all over the world. 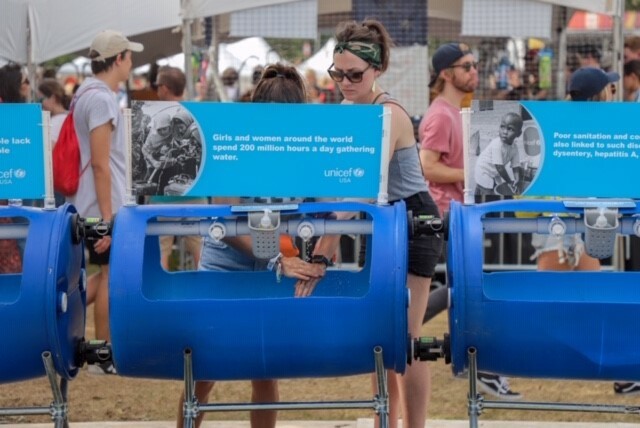 One of the recent opportunities took place at the annual Austin City Limits (ACL) Music Festival, which gave the UNICEF UNITE group from Houston, Dallas, San Antonio and other places the opportunity to raise awareness of UNICEF’s Water, Hygiene and Sanitation (WASH) program. The ACL Music Festival has been going on for almost two decades and hosts over 130 artists and 225,000 patrons every year at Zilker Park in Austin, Texas. In 2018, UNICEF Houston had the exclusive opportunity to support the festival and to raise awareness about global issues, thanks to over 140 volunteers who graciously donated their time during the Oct 5-7 and Oct 12-14th weekends. The UNICEF Houston office lead by Nelson Bowman, Regional Managing Director and Olivera Jankovska, Global Citizenship Fellow of the Houston office tirelessly supported a large hand-washing station, chair check-in area and educated concert-goers about WASH issues from all over the world. The services were not only helpful to the festival-goers, but the setup was educational too as most were drawn to the informational messages placed above the handwashing stations. These messages informed the public on the detrimental sanitation conditions children face around the world. For example, one of these messages read, “Girls and women around the world spend 200 million hours a day gathering water.” This brings awareness to how lack of clean water takes away time and opportunities for girls in developing countries. Reflecting on ACL, I understand now just how closely UNICEF USA works with partners in various sectors to reach and inspire people to act on global issues. 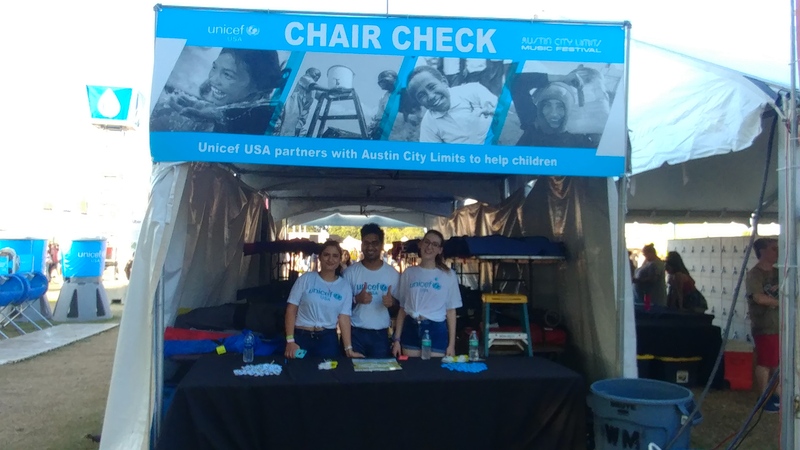 Historically, the Austin City Limits Festival provided a place for festival-goers to store their chairs; however, this year UNICEF USA provided this chair storage service for free. Our chair storage was an invitation for conversation between volunteers and patrons, and we were surprised to find that many people hadn’t heard of UNICEF before. Volunteers were very friendly and informative and struck up great dialogue with patrons, educating them about the great things UNICEF does locally and globally. We came together, from Houston to Dallas, San Antonio to Austin, and beyond, because of a common belief that the world’s children should come first. With that always in mind, I am excited to continue developing ways for the Houston UNITERS to remain connected as we continue to educate the community on behalf of UNICEF USA. Besides ACL, the UNICEF UNITE team in Houston has organized and supported numerous other activities and events. You can learn more about how to be involved with UNICEF USA and the UNITE team in Houston at unicefusa.org/unite.